When I was younger I remember watching Kim Possible on the Disney Channel. She was an awesome superhero and it was a fun show to watch! Now my daughter can enjoy a new Kim Possible. It has been aired on the Disney Channel and you can now own it on Disney DVD or buy or rent the digital copy. Wanna do a fun Kim Possible DIY craft? Save the world like Kim Possible in a cool, new Kim Possible Pendant Necklace! Make it yourself while you watch the Live-Action Kim Possible movie on DVD today! 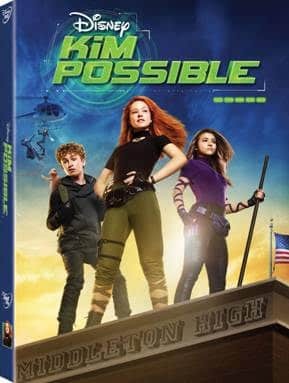 Based on the global hit animated series, the live-action “Kim Possible” Disney Channel Original Movie follows everyday teen hero Kim Possible and best friend and sidekick Ron Stoppable as they embark on their freshman year of high school, all while saving the world from evil villains. By their side every step of the way is teen tech-genius Wade and new friend Athena, who also happens to be a Kim Possible super fan and is eager to join Team Possible. While Kim and Ron have always been one step ahead of their opponents, navigating the social hierarchy of high school is more challenging than the action-hero ever imagined. With Drakken and Shego lurking in the wings, Kim must rely on her family and friends more than ever. Now it’s up to Team Possible—Kim, Ron, tech-genius Wade, new friend Athena and Rufus, a naked mole-rat that Ron meets along the way—to stop these super villains.